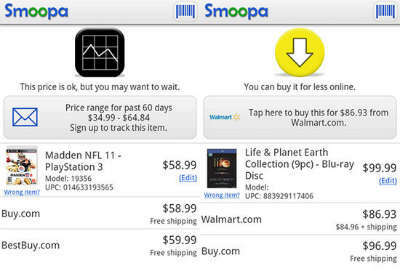 Smoopa, essentially, pays consumers to find good deals.There are plenty of apps that do this kind of thing already, of course–apps like Amazon’s and eBay’s–but Smoopa doesn’t just let customers check prices…Smoopa rewards customers for checking prices and finding good deals in the process. What Smoopa does is, every time a user scans an item at a store, they get a random chance to get credits. Smoopa’s credits can later be redeemed for gift cards, charitable donations, or even full-on rebate checks. Once a customer scans a barcode with Smoopa, the scan is routed through Smoopa’s database containing 20 million items, at last report. 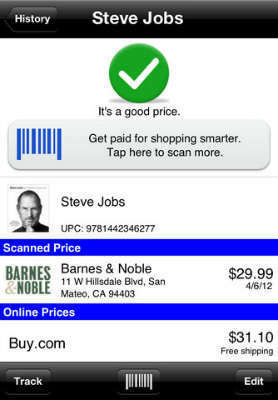 Then, other local stores are shown, and the user then updates the database with the local scan. A comparison is made and, should the user find a better price, they can arrange to purchase through the app as well. Plus, when Smoopa users refer their friends, they get a two dollar bonus for their efforts. This represents a substantial opportunity for small businesses to get ahead, especially those small businesses that serve as retailers. In fact, it suggests a couple clear potential applications: one, if you’re clear that your small business is best on prices, then promote it. Make your advertising reflect that you’re “Smoopa Friendly”. Then adjust your shelving accordingly to make the barcodes for your items easily accessible. Two, since Smoopa allows friends to recruit their friends, you may be able to get ahead by offering your own similar promotions, offering automatic discounts to anyone who recruits a friend to come to the business, or automatic discounts whenever a better price is found on Smoopa. Possibilities abound with Smoopa, but the point is that Smoopa is going to call very big attention to price. Price is just one part of the marketing mix, and while Smoopa is going to make price a big part of the mix, competing on other fronts is possible, and in many cases, desirable. Service is just as big a part of things, and good customer service can bring a lot of value to a venture. Good customer service can be accomplished with the help of cloud-based telephony tools like auto attendants and call recording functions. You may not want to play in the sandbox that Smoopa requires, but keeping it in mind will likely pay dividends for your business.